Before diving into firehose and why MQTT is used there it would to explain what MQTT is. MQTT is a machine to machine pub/sub protocol which is primarily targeted for IoT applications and sensor networks. It’s designed to be lightweight and work in environments where code size is a constraint or networking is unreliable or where bandwidth is at a premium. The protocol was originally written in 1999 and is now an ISO standard that is managed by the OASIS group. MQTT is based on a centralized broker. Clients publish and/or subscribe to topics on the broker to send and receive messages to each other. There are a variety of different brokers both open and closed source available. On the client side there are bindings available for a lot of different languages and environments. The interesting pieces of the MQTT protocol when it comes to firehose and similar applications running in a cloud environment are topics, quality of servicem and client persistence. The most obvious thing that makes MQTT different from a lot of other is how topics work. All message topics in MQTT are hierarchical and dynamic. This means that a topic is only created at message publish time and are dynamically matched with any clients subscribed. When coupled with wild carding is when this gets really useful. This enables you to build applications that listens only to the subset of messages you are interested in. Which uses the single level wildcard ‘+’, which will match any field on that level of the hierarchy. You can see how powerful using a combination of a detailed hierarchy and the wildcards let you dynamically subscribe to only messages your application is interested in. MQTT supports 3 levels of quality of service 0, 1, and 2. QoS level 0 means there is no guarantee on delivery, QoS level 1 means the message is guaranteed to be delivered at least once, but may be recieved more than once, and QoS level 2 means the message will be delivered once and only once. The interesting piece on QoS in MQTT is that it’s per message publish or per subscription. Meaning that when a client publishes a message that set it’s own QoS level for sending to the broker. Then when a client subscribes to a topic on a broker it sets QoS level for the subscription. These are independent from each other, meaning you can publish a message to a topic with QoS level 2 and subscribe to that topic with QoS level 0. This also means you can have an application hand pick the guarantees per message to optimize between the bandwidth and overhead for the individual messages if you need. The last aspect of the MQTT protocol that really makes it useful for an application like firehose running in a cloud environment is persistent sessions. Normally when a client connects to a broker it specifies it subscribes to the topics it’s interested in, but when the client disconnects those topics are lost. However, a client can specify a clientId and when that is combined with the higher QoS levels the broker will queue up messages to ensure that even if the subscribing client disconnects it will receive those messages on reconnect. This way you can ensure a client will never miss a message even if you lose connectivity. So with some background on what MQTT is and some of the strengths it brings to the table it’s time to take a look at the firehose. The OpenStack community’s infrastructure runs completely in the open to support the OpenStack community. This includes running things like the gerrit review system, the upstream CI system, and other services. It ends up being a very large infrastructure running over 40 different services on 250 servers (not counting hosts used for running tests) in OpenStack clouds which are donated by various OpenStack service providers. All of these services are managed using a combination of puppet to describe the configuration and packages and ansible to orchestrate running puppet on the different servers. All of these services are generating events of some type, whether it’s the completion of a task, a user initiated action, a periodic status update, etc. Some of the services have native event streams but a lot of them don’t. The missing piece was a single place to handle the events from all of these different services. Right now if a service has an event stream at all it’s exposed as a separate thing implemented in it’s own way. For example, Gerrit‘s event stream is implemented as a command run via it’s ssh interface (which is inherently specific to gerrit). This is where firehose fits in, it provides a unified message bus for all the different services running in the community infrastructure. This gives both users and other applications a single place to go when they need to consume events from any infrastructure service. The documentation linked above has a lot of code examples in a bunch of different languages. So you can use those examples to experiment with the firehose locally. In addition to documentation linked above we also have extensive schema documentation for the firehose. Which documents the schema for both the topics and message payloads for all the services, which can be found at: https://docs.openstack.org/infra/system-config/firehose_schema.html. This documents how messages are constructed for all the services publishing messages to the firehose. This should enable anyone to build off the messages in the firehose for anything they need. While this provides a description of what the firehose is and gives an idea on how to use it, it’ll be valuable to also talk about how it’s constructed and take a look how well it’s working. CPU Usage Ram Usage You can see the current numbers on cacti.openstack.org. About a year ago when we started growing our usage of firehose we decided to do some manual load testing. We first tried to leverage the mqtt-bench project to do this, but unfortunately it’s not being actively maintained. So we ended up writing pymqttbench to do this task. When we did this load testing we were hindered by the bandwidth limitations of 200 Mbps for the server flavor we deployed. However despite hitting that hard wall limiting our testing we were able to see some interesting data. 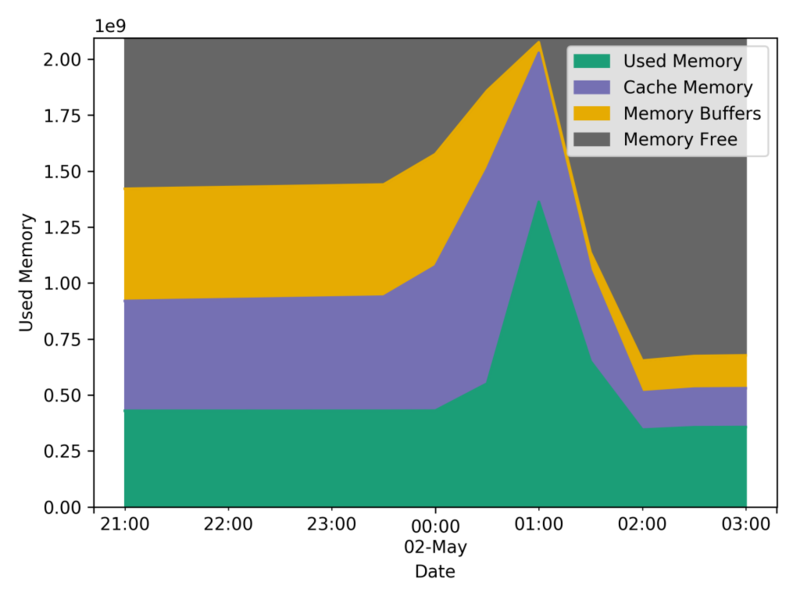 We ended up using more RAM (percentage wise) during the testing peaking at about 1.25 GB being used by Mosquitto. 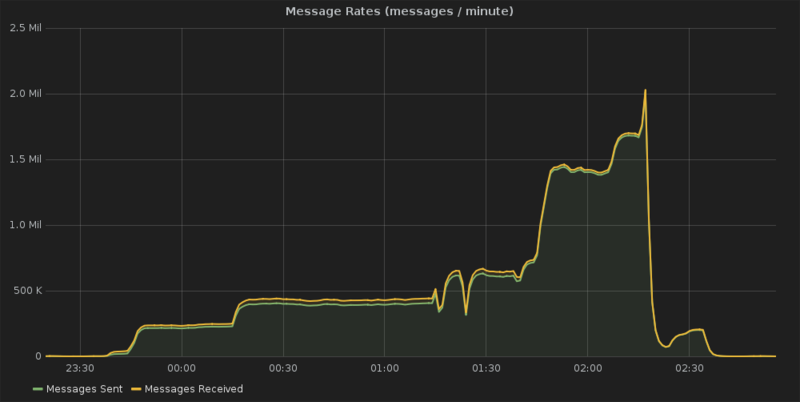 But the big spike corresponds to the CPU usage spike which occurred before the max message throughput. 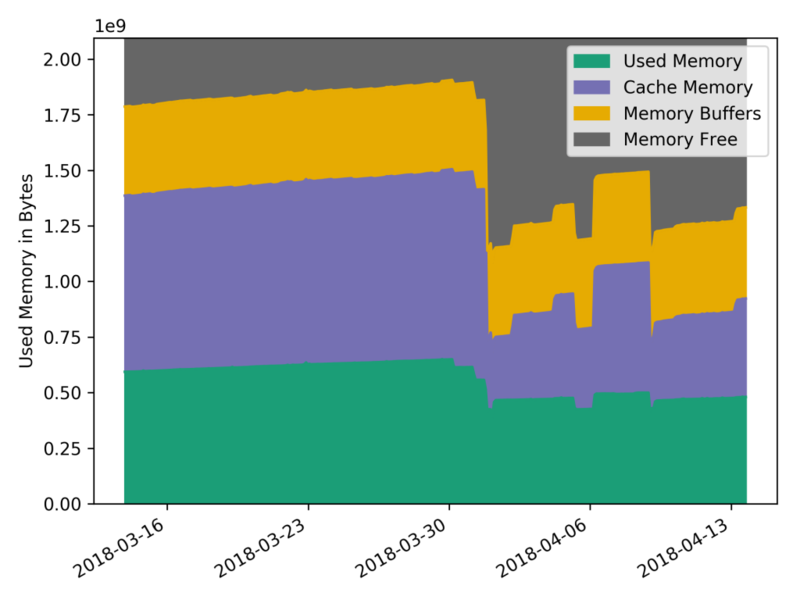 When you look at the RAM usage when we were at the max messages it was at about it’s lowest value, at between 250MB and 350MB. At some point we’ll have to revisit the load testing experiment. 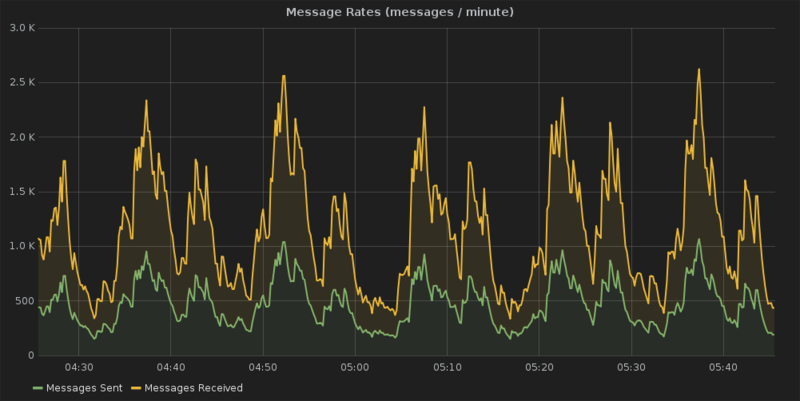 All this test showed was that the small server we have deployed is able to keep up with whatever load we throw at it, and have a large amount of headroom for more messages before we hit any limits of the small server we’re using, which admittedly was the goal of our testing. But, besides that it raised more questions than it answered about what those limits actually are, which is something we still need to investigate. To tie everything together what has the firehose project shown us about using MQTT for applications in the cloud. The first thing is the lightweight nature of the protocol is a great fit for the cloud. In most cloud environments you pay for your resource utilization, so the less you use the less you have to pay. What firehose has demonstrated in this regard is that by using MQTT you can get away with minimal resource utilization and still have a solution that will work with a large load. Another key aspect is MQTT’s resiliency to unreliable networking. The old adage of treat your servers in the cloud like cattle not pets holds true. You can look at other aspects of OpenStack’s community infrastructure and see all sorts of failures. 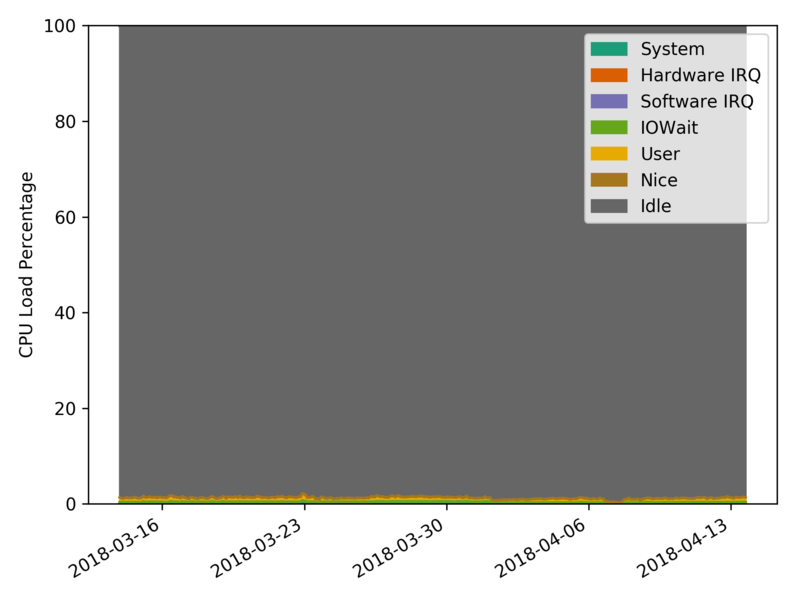 For example, http://status.openstack.org/elastic-recheck/index.html#1298006 tracks a failure in the CI system where a test node can’t talk to the git servers. 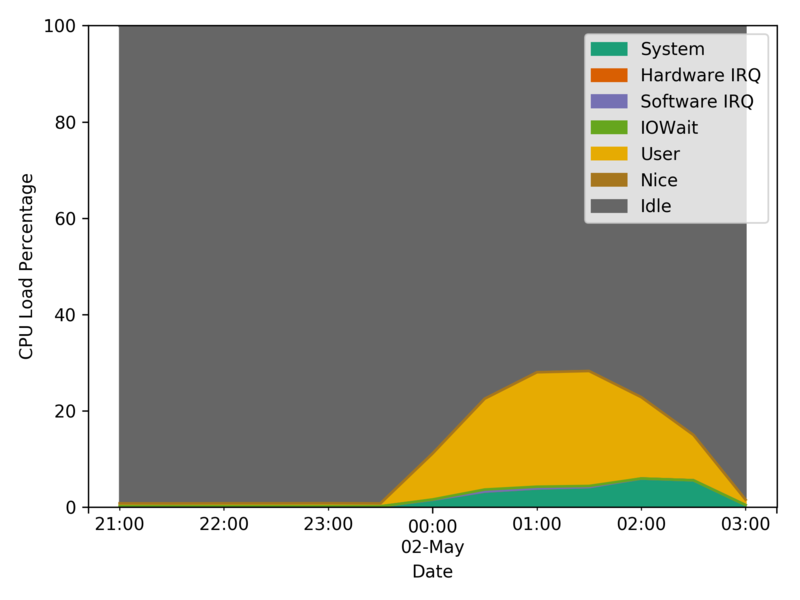 That graph shows how frequently we’re encountering random networking issues in a cloud. We’ve been running firehose since Autumn 2016 and I can’t recall of any instances when a service or client lost it’s connection and wasn’t able to recover seamlessly. This is including several broker restarts for service upgrades and configuration changes. The last aspect here is because MQTT has been around for 20 years there is a large ecosystem that already exists around the protocol. This means regardless of how you’re building your application, or what language it’s written in, there is likely already support for using MQTT there. This means you don’t have to spend time reinventing the wheel to add support for using MQTT or you can leverage existing projects to do common functions with MQTT. What this whole project has demonstrated to me is that the application requirements for IoT and remote sensor networks aren’t that dissimilar from writing applications in the cloud. The next post in this series will be looking at using MQTT in applications deployed on Kubernetes.